Growing up, I always knew there was something different about several of my family members. They had to prick their fingers multiple times a day, give themselves shots and some had a weird box-like object attached to their waist. As I grew older, I learned they have an all too common autoimmune disease known as Type 1 Diabetes. In Type 1 diabetics, the body’s immune system attacks the cells in the pancreas that make insulin. This classifies the disease as an autoimmune disease. With their bodies not producing insulin, those with Type 1 are subject to horrific highs (high blood sugar) and devastating lows (low blood sugar). Ultimately, having highs and lows can even cause a person with Type 1 to die. It is believed that Type 1 occurs due to genetic and environmental causes, yet scientists still don’t fully know what causes it. There is nothing you can do to prevent Type 1, including diet and lifestyle changes, and there is nothing you can do to get rid of it. People who live with Type 1 must balance insulin doses constantly and test their blood sugar by pricking their fingers six or more times a day. JDRF also notes there are 1.25 million Americans living with Type 1; each year, 40,000 people are diagnosed with Type 1. In the U.S., five million people are expected to have Type 1 by 2050, and most concerningly, one-third of Americans with Type 1 are not managing their blood glucose levels. The disease ultimately killed my grandmother’s brother and then later on in her life, my grandma was diagnosed with the disease. My Uncle Matt has the disease and two of my cousins, Austin and Jordan, were diagnosed with Type 1 as well. I became more interested specifically in Type 1 diabetes in January of 2015 when I heard of a little girl, Kycie, on Facebook who needed prayers. She had been ill for a few days, when her mom took her to the emergency room. Kycie underwent therapy for weeks, and finally in May of 2015, she was able to return home. However, Kycie still required care 24 hours a day, due to the brain injury which left her unable to speak, walk or feed herself. Her brain injury, combined with her inability to care for herself and the unpredictable highs and lows of Type 1, made her situation dire. I followed Kycie’s progress on her Facebook page, cheering along with everyone else at the video updates. It was heart-wrenching, however, to see this formerly bright, bubbly little girl barely able to roll over because of brain damage caused by Type 1. Tragically, she developed pneumonia and had to be re-hospitalized. Kycie eventually returned home where she passed away three days later, on July 11, 2015. When I learned of Kycie’s death my heart broke. I learned through her journey and her family’s willingness to share it with the world the horrible complications associated with Type 1 diabetes, especially if they go undiagnosed. With four people in my family diagnosed, my mind immediately went to them. This could happen to them. I reached out to my two cousins via email – Austin, 24, and Jordan, 25 – who just so happen to be brothers. Austin was diagnosed with Type 1 first in 2005, and then in 2009 Jordan was diagnosed as well. I asked them what living with Type 1 was like. While I know they can’t summarize all of the effects the disease has on them, their responses do provide insight into what living with the disease is like. Jordan told me that one of the hardest aspects of the disease for him is maintaining blood sugar control. Images such as the one below claiming that soda pop can cause diabetes caused outrage amongst many people in mid to late 2015. 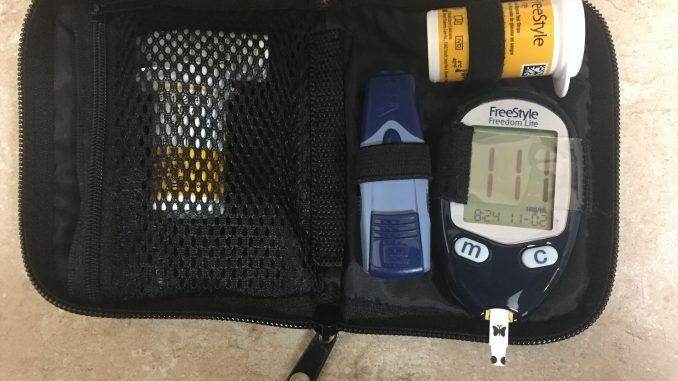 Another respondent to the claim the above image makes of drinking soda pop and getting diabetes, was a mom of a Type 1 son who has a diabetic alert dog. Luke and his dog, Jedi, share their story on Facebook through Luke’s mother’s daily posts about their experiences. Type 1 Diabetes is a serious issue, yet it seems to me that it is rarely talked about on TV and other platforms. With only five percent of people with diabetes having Type 1, it starts to make sense. People start to combine attributes of other types of diabetes to Type 1 diabetics. Type 1 diabetes frequently gets confused or mixed up with Type 2 diabetes, which is the most common form of diabetes. Type 2 diabetes develops when the body doesn’t use insulin properly; the body still produces it, but the body doesn’t use it correctly, leading to insulin resistance. With all the misconceptions surrounding Type 1, I decided to ask my cousins what they wished people knew about Type 1. While I know I get frustrated with images portraying Type 1 as something preventable by not eating sugar, I asked for my cousin’s thoughts on images like it. November is National Diabetes Month and with the disease being so prevalent in our country, I encourage everyone to learn the truths behind Type 1 and Type 2 Diabetes.